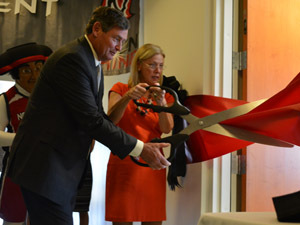 Funded by a grant from the NCAA, CSUN opened the Matador Achievement Center (MAC) in Bayramian Hall on Monday evening. 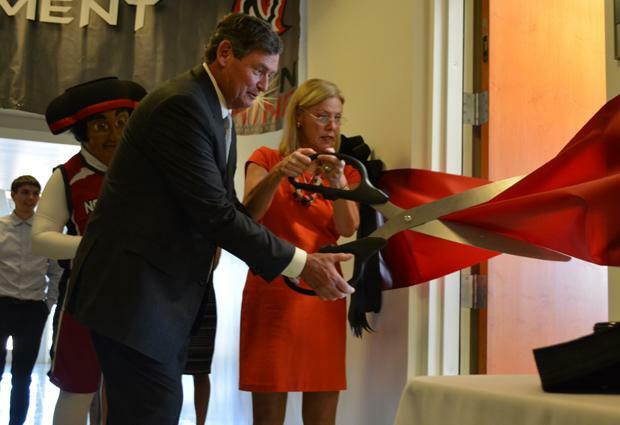 In a ceremony led by CSUN President Dianne F. Harrison, the center was unveiled in a ribbon-cutting ceremony attended by student-athletes, coaches, athletic department personnel and NCAA representatives. “The great people in athletics and academic affairs put their heads together, wrote the proposal, and was successful in getting this funded and getting this to happen, so we’re very very pleased,” Harrison said. CSUN was awarded a grant of $900,000 over three years by the Limited-Resources Institutions Grant Program Pilot, a program approved by the NCAA Executive Committee. President Harrison said the center would reach out to over 200 new student-athletes as three additional staff members were added. “We’re going to move from targeting one team using a successful model that started with the men’s basketball team, to adding seven additional teams,” Harrison said. Andrea Hernandez, the MAC’s tutoring coordinator, explained how the center would help student-athletes with not only tutoring, but mentoring as well. “The mentoring aspect is helping them develop life skills, especially for the freshmen, and pairing them with a student athlete that is a sophomore or junior that can show them the ropes can help them ease the transition,” Hernandez said. Hernandez also elaborated on the tutoring aspect of the MAC, which is led by student-athletes as well. Katie Hooper, a freshman utility player on the softball team, and Jennifer Tyler, a senior pitcher, both expressed their happiness with the new center. “Having this mentoring program is really helping me get on top of my game, learning all the aspects of the campus and how to use my resources well, and the tutoring is really helping also knowing I have someone to go to if I need help,” Hooper said. Tyler, Hooper’s mentor, agreed that the new mentoring resources are much more helpful than before. New resources include computer labs just for student-athletes, private study areas and access to advanced calculators, translators and iPads not available to regular students. The MAC has allowed student tutoring and mentoring to become its own department, as they formerly shared a department with student-athlete advisement. Although the center was just opened, staff members are already looking forward to increasing opportunities for student-athletes.